I don't always need the biggest voice possible - sometimes I just need a thing to follow along with the Teletype's burblings, or a third voice for squeaky noises, or just a simple melody line. I recently got an ALM MUM M8 filter, and ran across a good deal on a Braids - and was trying to wedge them into my system. I was mapping things out on Modular Grid when, low and behold, I realized that (with the built-in VCA) I had the better part of a synth voice with these two modules. Given that I could situate them near a Maths, it was a no-brainer to give it a try - and what success! 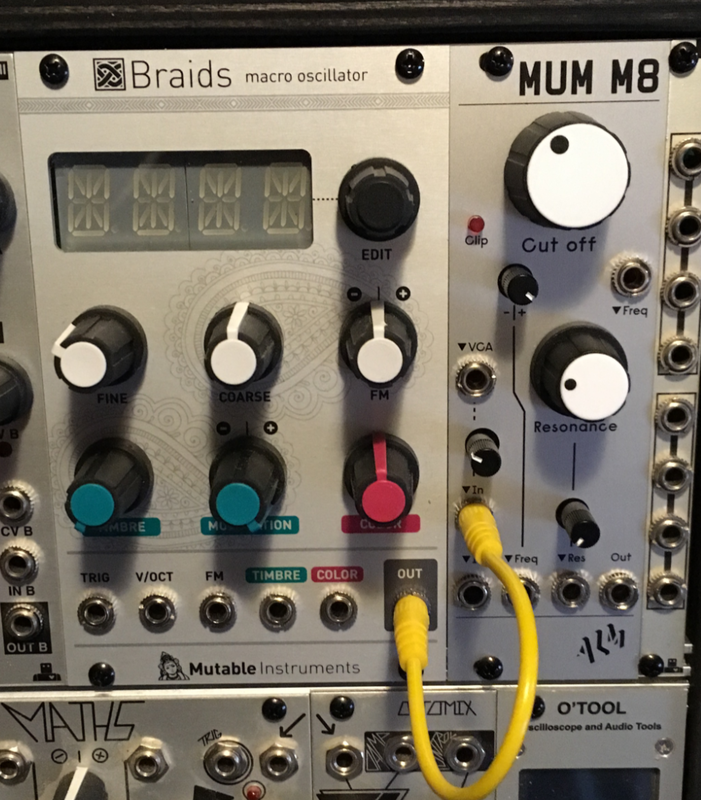 The MUM is based off the digital filters of Akai samplers, and it's a really appropriate match for the digital voicing of the Braids. This is especially true when I use some of the weirder voices of the MI oscillator (like the RING, FOLD or VOSM voicings) as well as with the FM implementations. The bright and raw sound of the M8 matches perfectly, and I'm finding myself using it as more than my 'third leg' - instead, it's becoming a peculiar (but useful) primary voicing choice. So there you go - sorta the opposite of the analog purity of a modular, and more like the digital inevitability that I was going to succumb to! Yet another sweet+sour corner of my system. Whee!